The Indian Space Research Organisation (ISRO) is all set to launch its newest remote sensing satellite Resourcesat-2A on Wednesday, Dec. 7, atop the country’s flagship PSLV launcher. The rocket will lift off from the First Launch Pad (FLP) at the Satish Dhawan Space Centre in Sriharikota, at 10:25 a.m. local time (4:55 GMT; 11:55 p.m. EST on Dec. 6). The mission, designated PSLV-C36 will be the 38th flight of the Polar Satellite Launch Vehicle (PSLV). It is tasked with delivering Resourcesat-2A into a polar sun-synchronous orbit (SSO) at an altitude of about 514 miles (827 kilometers) after a flight lasting roughly 18 minutes. Resourcesat-2A was originally planned to be launched aboard the PSLV-C35 mission which took to the skies on Sept. 26, 2016, however it was rescheduled to November 2016 as ISRO decided to send the satellite on the PSLV-C36 mission. The PSLV-C36 flight itself was then postponed from Nov. 23 to Nov. 28 and finally delayed to Dec. 7. 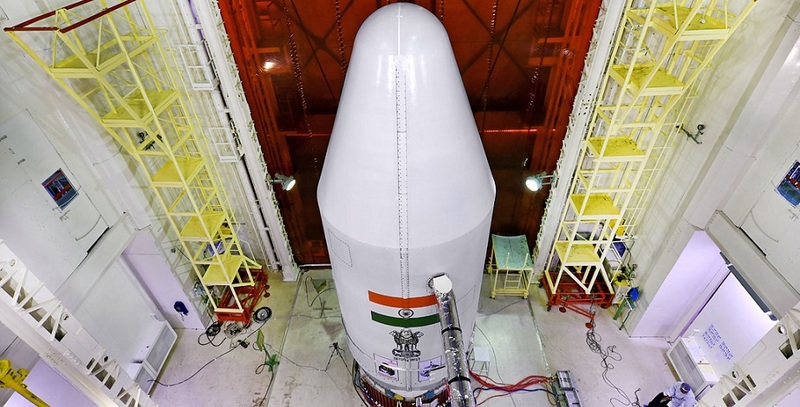 There were various plans to launch other smaller payloads together with Resourcesat-2A on PSLV-C36, but they were not confirmed by ISRO and apparently the remote sensing satellite will be the only passenger of Wednesday’s flight. On the list of additional payloads were two Indian satellites: IITMSAT designed for ionospheric research and an Earth-observing spacecraft named NIUSAT. The Italian Max Valier Sat nanosatellite for X-ray astronomy research and a Latvian nanosatellite Venta-1 built for ship tracking purposes, were also on the list. Now, all four additional spacecraft are likely to be orbited in 2017. Final preparations to launch the PSLV-C36 mission kicked off in late November when the rocket was fully assembled and the spacecraft was installed on top of the launch vehicle and encapsulated in a protective payload fairing. The exact date of the liftoff was confirmed by ISRO on Nov. 30 and on Dec. 5 the Mission Readiness Review (MRR) committee and Launch Authorisation Board (LAB) have cleared the mission for the start of a 36-hour countdown for the liftoff. During the countdown campaign, the engineers have the final opportunity to conduct last tests and checkout of the launch vehicle and its systems. The rocket is then also filled with propellants and the final reconfigurations are made just hours before planned liftoff. The lengthy countdown leads to the start of an automated sequence which begins usually about 14 minutes before the launch and when the countdown clock hits zero the rocket’s first stage is ignited. Resourcesat-2A that will fly into space on Wednesday is a remote sensing satellite designed for resource monitoring. The spacecraft, built by ISRO is based on IRS-1 platform and weighs around 1.235 metric tons. The satellite features two deployable solar arrays generating up to 1,700 W of power for the designed lifetime of five years. Resourcesat-2A carries three imaging cameras: two Linear Imaging Self Scanners (LISS-4 and LISS-3) and the Advanced Wide Field Sensor (AWiFS). Moreover, it is equipped in two Solid State Recorders with a capacity of 200 gigabits each to store the images taken by its cameras. LISS-4 is a high resolution camera operating in three spectral bands in the Visible and Near Infrared Region (VNIR) with a 5.8-meter spatial resolution and steerable up to about 26 degrees across track to achieve a five day revisit capability. LISS-3 is a medium resolution LISS-3 camera operating in three-spectral bands in VNIR and one in Short Wave Infrared (SWIR) band with 23.5-meter spatial resolution. AWiFS is a coarse resolution camera operating in three spectral bands in VNIR and one band in SWIR with 56-meter spatial resolution. Resourcesat-2A is expected to continue the remote sensing data services to global users provided by previous satellites in the series: Resourcesat-1 and Resourcesat-2, launched in 2003 and 2011 respectively. The 144 ft (44 meters) tall XL version of the PSLV, which will be used for Wednesday’s mission, is the upgraded variant of the rocket in its standard configuration. Its thrust is increased by the addition of more powerful, stretched strap-on boosters than on the standard version. The vehicle has a mass of 320 metric tons at liftoff and uses the larger strap-on motors (PSOM-XL) that provide the capability of hoisting heavier payloads into orbit. PSOM-XL uses the larger, 1-meter diameter, 44 ft (13.5 m) length motors. This version of the rocket carries 12 metric tons of solid propellants instead of the nine metric tons that were used on an earlier configuration of the PSLV. Wednesday’s mission will be India’s seventh launch this year and the sixth orbital flight for PSLV in 2016. The country’s next flight is currently scheduled to take place on January 18, 2017 when a GSLV Mk III rocket will send ISRO’s GSAT-19E communications satellite into orbit.